Colvin & Moggridge » Jardines de Alfabia. 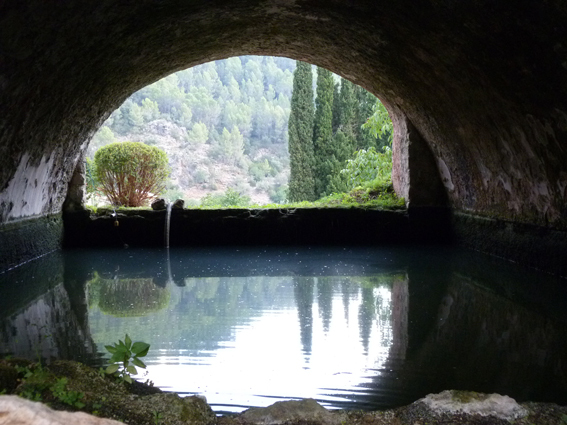 Whilst on our Mallorcan practice field trip three of us made the short journey from Palma towards Sóller to find the gardens of Alfabia. Located at the foot of the Tramuntana mountains the house, gardens and orchard form a complex that dates back to the Arab era of Mallorca. Alfabia was the residence of the Moorish governor of the Balearic Islands and although the house has been much altered over the centuries, the gardens retain strong Moorish characteristics. Today they are in mild disrepair, though some restoration is taking place, and horticultural interest is limited, but they have a powerfully romantic atmosphere: raised pergola walks with arching jets of water to catch the unwary visitor; rills and pools (though much of the water was not running at the time of our visit) shaded by palms; wonderfully serpentine ancient wisteria; steps and balconies, sculpture and fountains; and the whole garden commands orchards of citrus and olive. The sheep that graze these orchards, with their tinkling bells, created the perfect setting for our lunch of local bread and cheese. Last year Mallorca, this year the Netherlands. Art and Nature: an idyllic marriage.